Why is Twitter Partnering with Foursquare? What businesses need to succeed, both with regard to local search and social media is full, correct and up-to-date information. Users of apps such as Foursquare are apt to update information and give a better picture of the business. Monday, Twitter announced that its tagged location data would be powered by Foursquare, once the leader in check-in technology. As Facebook has greatly evolved its location data and other apps such as Yelp allow users to check in to receive deals and discounts, Foursquare gained heavy competition. Your 7 billion checkins have taught us about more than 65,000,000 places that exist in the world. The 250,000,000 photos and 70,000,000 tips you’ve left have shown us what’s great inside those places. The 90,000,000 “tastes” you’ve added to your profiles have taught us about the things you want us to help you find. The hundreds of millions of API calls we get per day from the 85,000 partners building on our platform contribute the freshness of the data and our popularity scores for places. In addition to building the world’s most accurate place database, we’ve learned how to see buildings the way our phones see them — as shapes and sensor readings on the ground rather than boxes viewed from space. We’ve built software that can understand when people move through, stop within, and then move on from these shapes — whether the shapes are places, neighborhoods or cities. And we’ve built search and recommendation algorithms that get smarter as they learn about the shapes you choose to spend time in and the shapes you simply pass through. Adam Dorfman, the Senior Vice President of Product & Technology at SIM Partners, told SocialTimes that the partnership made a lot of sense. Foursquare is one of the most important places where they can make sure this information is correct. … A lot of times people will ask, “Well, how is Foursquare going to make money?” and I look at the access that it has to this kind of really good business information. What businesses need to succeed online, both with regard to local search (Google) and social media (Facebook) is full, correct and up-to-date information. While Google is getting better at this, users of apps such as Foursquare are more apt to update information and give a better picture of the business. The Twitter/Foursquare relationship creates an opportunity for businesses (such as large enterprises with multiple locations) to create more location-relevant information, such as offers and recommendations. For instance, if you Tweet about the lunch you are having in the Embarcadero Center in San Francisco, the Banana Republic Twitter account that you follow just might want to let you know about a sale going on at the nearby Banana Republic in the Financial Center. But retailers are not the only brands that can benefit. For instance, a medical practice might share with you information about the doctors at its location depending on where you are and what you are doing. The relationship is also a huge win for Foursquare because Foursquare extends its reach as a source of business data for third-party applications. Foursquare already supplies data to Uber and Pinterest to make those apps more locally relevant. Partnering with Twitter makes Foursquare a more influential player in local search. 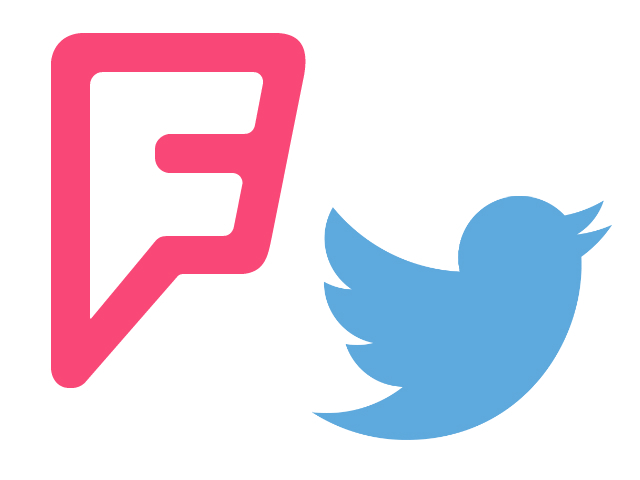 Readers: What was your reaction to the Foursquare/Twitter partnership?